Finally, here it is the much awaited day of the year for all the DMS Mysore Alumni's. 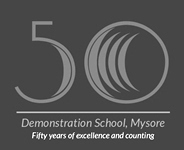 The DMS Alumni Trust in association with the Demonstration School is hosting the 2nd Global DMS Alumni Meet. Sign-Up ? register on Website and stay tuned for more info. If your interested in joining hands with us to oragnize this event, drop a mail to dmsaam@gmail.com with your contact details we'll call you back.